Thinking about GIFs and the future. 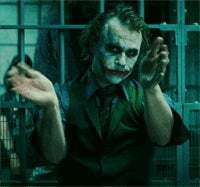 Dr. Lizardo posted this GIF in his government thread an it got me thinking. It would work much better without the guy in the background walking past. Since movie and TV show makers know that their work will be made into GIFs and distributed on the internet, are there savvy ones who are thinking about which bits will be taken and looped and making them more suitable? For instance would Christopher Nolan have had that guy walking behind the Joker if the film had been made today? I doubt the studios like people making GIFs as it is technically copyright violation, but it doesn't reduce their revenue; people aren't going to watch a two second GIF instead of seeing the movie, in fact it's free advertisement and, in this instance, keeping a five year old film in the public conscience. I imagine the people making the movies and TV shows, on the other hand, want people to make GIFs of them. You have to really love something to go to the effort to do something like that. So are they identifying the most GIFfable moments and increasing their loopability? Because I would be.